Uponor AquaPEX® tubing is used in hot and cold water distribution systems and AquaSAFE™ residential fire safety systems. Uponor AquaPEX® tubing is suitable for use in hydronic heating applications where the system contains no ferrous corrodible components or where any ferrous components are isolated from the tubing. Uponor AquaPEX® tubing coils and straight lengths come in red, white and blue for potable-water applications, and purple for water-reclamation applications. Uponor AquaPEX® tubing is manufactured and listed to ASTM F876 and F877 and CSA B137.5, certified to NSF Standards 14 and 61 and listed by the Hydrostatic Stress Board of PPI at 200 deg F at 80psi, 180 deg F at 100psi and 73.4 deg F at 160psi. 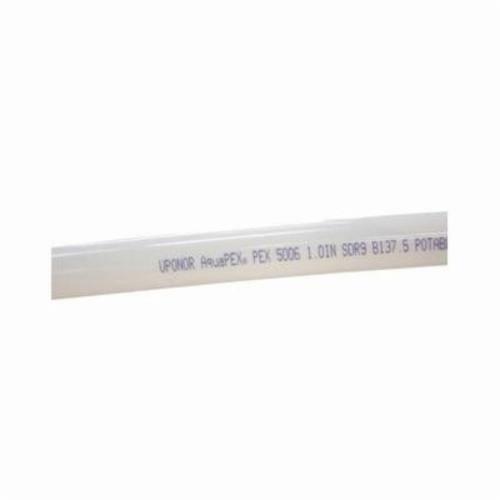 Uponor AquaPEX® white tubing (1/2", 3/4", 1" and 1-1/4" only) is also listed to UL 1821 and ULC/ORD C199P and carries an additional rating of 120 deg F at 130psi.